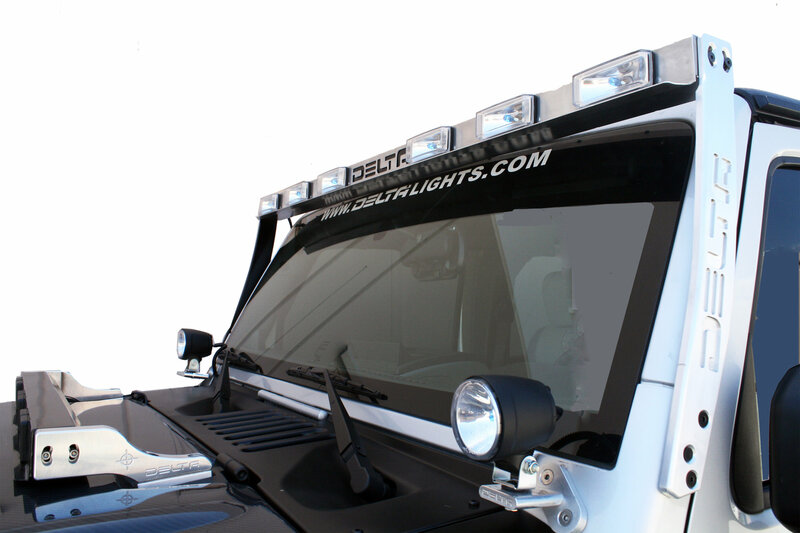 Delta All Aluminum SkyBar was specifically designed for Jeep Wrangler JK. It is available in either brush aluminum or black powder coated finish. Constructed of laser-cut Aluminum cross bar and machined billet Aluminum mounting arms holding a battery of 4 HID driving lights delivering an awesome 210 watt of power. The bar does not interfere with any roof, soft or hard top. Its well integrated design provides an esthetic addition to the vehicle and allows for garage clearance. The All Aluminum Skybar is corrosion proof and weighs only 14 lbs. It features five LED Cab Lights on top, an anti-glare deflector and 3 phases harness, controlling 2, 4 and all 6 lights. The mounting billet arms attach to the existing bolt holes thus requiring NO DRILLING. It comes complete with pre-wired OEM double harness and two switches.